Here are seven signs you might be experiencing a spiritual breakthrough. When I starting dropping off a bit on my daily Bible reading, I noticed that my days didn’t go as well as they had when I had committed to reading at least one chapter from the Old Testament and from the New Testament every day. I fed on the Word of God before I ate breakfast. No Bible, no breakfast! Thankfully, I was convicted by my neglect of the Word of God and re-committed myself to staying in His Word every single day. I asked God to give me a greater hunger and a deeper thirst for His Word and for His righteousness. He answered my prayer, and now, it’s like I can’t wait to get up to read what happens next! Right now I’m in 2nd Kings Chapter 13 and in the Book of Titus. When you have a renewed hunger for the things of God, much like the deer that pants for water as the psalmist writes, “As a deer pants for flowing streams, so pants my soul for you, O God” (Psalm 42:1). If that’s you right now, you’re probably experiencing or getting ready to experience a spiritual breakthrough, and what better breakthrough than living by every word of God that proceeds out of His mouth and in His Word, the Bible. No one that I know of has stopped sinning after they became a believer. I certainly cannot claim to be sinless. The Apostle John wrote, “If we say we have no sin, we deceive ourselves, and the truth is not in us” (1st John 1:8), and “If we say we have not sinned, we make him a liar, and his word is not in us” (1st John 1:10). Even Solomon understood that “there is not a righteous man on earth who does good and never sins” (Eccl 7:20), but thanks be to God, “If we confess our sins, he is faithful and just to forgive us our sins and to cleanse us from all unrighteousness” (1st John 1:9). Now that we know none of us is sinless, it doesn’t excuse us from sinning, less! In other words, we’re still not sinless, but we should be sinning less, over time. We ought to look back at our life just a few months or years ago and see how we have forsaken one sin after another, even though we’re still not sinless, but now that we’ve been born again (1st John 3:6), sin doesn’t have dominion over us like it used to (Rom 6:1-14). If you find that you’re sinning less, that my friend is truly a spiritual breakthrough. Our small church is trying to grow closer together and that’s an advantage that small churches have over large ones. We know everyone by name. We know what they’re going through, where they work, and who they’re friends and family members are. That connects us so much more than just a casual acquaintance we might have with our neighbors. If you want a spiritual breakthrough, try having a closer connection with God by walking in obedience. The greater our obedience is, the greater our intimacy with the Father will be. Of course, our relationship will never change. We can sin, but He will not stop being our Father any more than an earthly father’s child who disobeys him will no longer be his child. The father’s not going to disown their child for that! Neither will our Father. A closer relationship with the Father naturally leads to a closer, more intimate relationship with the members of the Body of Christ, the church. If we love God, we will love God’s children. If we love Christ, we will love those He died for. How can we say we love God but not love His children (1st John 3:15)? When you discover that you and your church are growing closer together, whether through prayer, Bible study, or crisis (or all three), you and/or your church might be preparing to see a spiritual breakthrough, and pray that it would be for the glory of God, because nothing else matters. Personally, I believe we ought to be the most joyful people on the planet, but sometimes, we look like we’ve eaten sour grapes. I include myself in that company, but that’s perhaps a way that we can learn contentment, like the Apostle Paul who said “I have learned in whatever situation I am to be content” (Phil 4:11), and how did he learn contentment? Lots of practice in misery, as he was beaten, stoned, flogged, whipped, and Imprisoned and suffered from hunger, thirst, and every kind of deprivation…yet, he wrote the Book of Philippians while in such settings. Some call it the “Joy Epistle” for it spills over with the joy Paul had. Our music worship leader is always abounding with joy, so much so that he often shouts during praise music. He just can’t contain himself…and you have to love that about the man. He has a passion for worship and this passion when being fulfilled at worship services, makes him overflow with joy that it runs over and influences others! When you change jobs or have a schedule change, it can be quite challenging, but that might be an open door for a spiritual breakthrough. I remember an old seminary professor say, “When faced with an equally hard decision to make between two things, pick the harder because it will bring more glory to God and make you depend more on God.” Wow. I thought that was good advice. The harder things are the more rewarding things they bring. Great risks seem to produce great rewards for many, and these are the times when you’re literally flying on “a wing and a prayer” and there’s nothing else to it. God may be tempering your faith with the trials of life to ensure its strong enough for the next flight of faith or spiritual breakthrough. When I say that a burst of energy or two may be a sign you’re experiencing a spiritual breakthrough is when it is sustained for a time and not just when you feel like it. It’s almost as if you can’t contain yourself, perhaps sensing that something’s about to happen. That’s what I’ve heard a few others say what it’s like. One man described it like Jeremiah did as if “I will not mention him, or speak any more in his name,” there is in my heart as it were a burning fire shut up in my bones, and I am weary with holding it in, and I cannot“ (Jer 20:9). I believe I have felt that before when we started to evangelize in our city. It was both scary but exciting. It’s as if God has just opened a door for our church and our zeal and excitement were almost too much to contain; almost as if they’re going to bust if they don’t do whatever it is that God’s called them to do. I truly believe God has a sense of humor because of the way that I began a ministry when I wasn’t even trying. We had a member of our church who, unfortunately, broke her hip and she had to go to live out the rest of her days in a nursing home because of her advanced age. Sad as that was, I went to visit her and noticed that others were just sitting in the day room or in their rooms and had no one to talk to. When I began finding out the number of visitors these people had I was saddened. Only about 4 in 10 nursing home or assisted living center residents every have any visitors, and that includes their family and friends or neighbors. When we finally, by accident, started a nursing home ministry, we finally were practicing what James called, “pure religion” (James 1:27). That was a spiritual breakthrough for us and now, we can tell others how they can do the very same thing in their community. We’re so excited about it that we’re ready to share any information with you to help you or your church start your own ministry for the orphans and widows in their affliction (James 1:27). 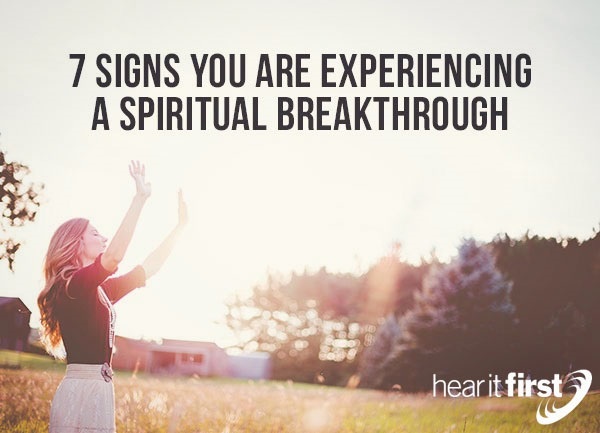 I hope these signs have served to be useful to you so you can know whether you have had or are having a spiritual breakthrough. They are not scientific, but they are, I hope, biblical. Of course, any breakthrough must by empowered by God’s Spirit and must be for His glory alone. We have nothing that we have not had given to us so how could we ever boast about anything (1st Cor 4:7)? We must give God all the glory for anything that we do in serving others.